Angie started laying the foundation for down-home Soul food around the late 70's, when she cooked in the Carnegie Hotel in Cleveland, Ohio. Within the confines of that kitchen she concocted recipes that she brought with here from Santuck (Union), South Carolina. Emphasizing on preparing everything from scratch and blending the perfect seasonings, she started to build a following around the city that supports Angie's still today. In 1986, Angie ventured out on her own to open the first of many Angie's locations, starting at 58th & Euclid, 71st Between Euclid & Carnegie, 55th & Euclid (which became the most popular), and then on to 76th & Cedar. In 2008, she decided to retire from the business aspect and just cook for the pure love and enjoyment of it. In the following years, Angie's family has opened new locations on 79th & Carnegie, 3859 Superior, 16906 Harvard, and 1100 N. Martin Luther King Blvd. ; Las Vegas, NV. Any day of the week you will still find Angie in one of these kitchens doing what she Loves to do. 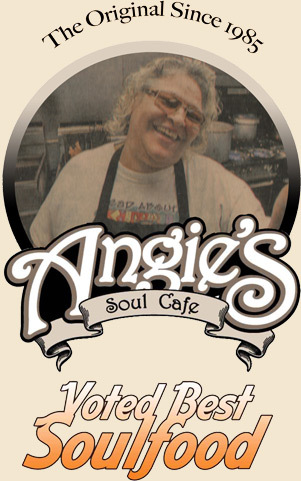 Along with the evolution of the Angie's brands (Angie's Kitchen, Angie's Soul food, Angie's Chicken & Waffle, Angie's Mobile Service, and Angie's Soul Café) her family has opened "Carolina's Southern Cuisine"(Temporally Closed) and "ZanZibar Soul Fusion" in historical Shaker Square. Although not the unembellished atmosphere that Angie's is known for, the food is still very much the same southern style cooking that she brought with her from that little town called Santuck over 50 years ago. So if you have ever experienced Angie's before, we thank you for your support and please sign up for our email club so we can keep you informed of our evolution. If you have not yet experienced Angie's southern style cooking we look forward to you becoming one of the extended family, so please give us a try and see why we are still here 25 years and 3 generations later. Copyright 2010. Angies Soul Cafe.